Super Screen Capture is a user friendly and useful application for screen capturing. It is known as an all-in-one screen-capture software The screen capture tools in this software allows users to capture screen in various ways including the full screen capture, window capture, video screen capture, scroll capture, region capture, directx capture, sound record, etc. Super Screen Capture has an easy-to-use and intuitive interface. It can capture anything that you can see on your screen: easily and fast. After capturing the image on the screen, users can do editing to the image via its powerful image edition tools. 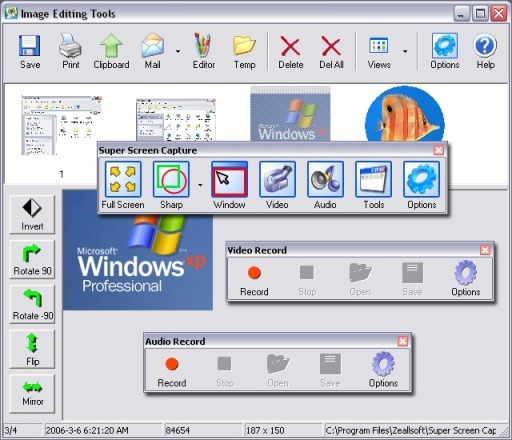 Users can choose various outputs for the captured object such as clipboard, printer, editor tool, email, temporary folders or other popular formats. This screen capture software is available for downloading in its trial version. Click HERE. It supports all popular internet formats such as JPG, BMP, GIF, PNG, etc. It can be used for all Windows platforms.